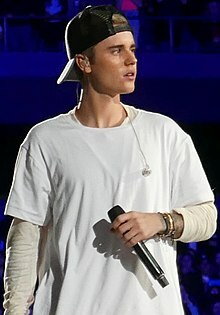 Iustinus Bieber (vulgo Justin Bieber), natus Iustinus Drew Bieber (vulgo Justin Drew Bieber) in Stratford Ontarionis die 1 Martii 1994) est musicus popularis, histrio, et cantor-scriptor carminum Canadiensis. Atlantae Georgiae nunc habitat. ↑ Collar, Matt; Leahey, Andrew. "Justin Bieber: Overview". All music. Macrovision Corporation . Vicimedia Communia plura habent quae ad Iustinum Bieber spectant. Novissima mutatio die 5 Augusti 2016 hora 17:46 facta.